The Rhine flows 820 miles through four countries — Switzerland, France, Germany and the Netherlands — from the Swiss Alps to the North Sea. Though some cruises operate between Basel, Switzerland, and Amsterdam, in the Netherlands, or Dusseldorf, Germany, the most popular section of the Rhine is between Mainz, at the confluence of the Main and Rhine, and Cologne. Mainz is the birthplace of Johannes Gutenberg and home to the Gutenberg Museum, which presents the history of printing. It’s not long before riverboats departing Mainz reach Rüdesheim, perhaps one of the Rhine’s most charming villages. Rüdesheim is situated in the heart of the Rheingau wine-producing region, and the wine taverns along the narrow and lively pedestrian street known as Drosselgasse are packed with locals and tourists enjoying Reisling, sparking Sekts or local brandies. Heading north from Rüdesheim, river cruisers pass half a dozen or more castles on both banks as well as the storied Lorelei, immortalized by poet Heinrich Heine, who wrote about a mysterious nymph who distracted sailors and lured their boats onto the rocks to their deaths. The river passes more castles, along the most-castled section of river in Europe, before reaching Koblenz, situated at the confluence of the Rhine and Moselle rivers. Some cruises follow the Moselle from Koblenz. For those cruises that continue along the Rhine, the river continues past more castles to Germany’s capital, Bonn, and Cologne, with its famous cathedral, a World Heritage Site and one of Germany’s best-known architectural monuments. These cruises conclude (or begin) farther along the river at Dusseldorf or Amsterdam. 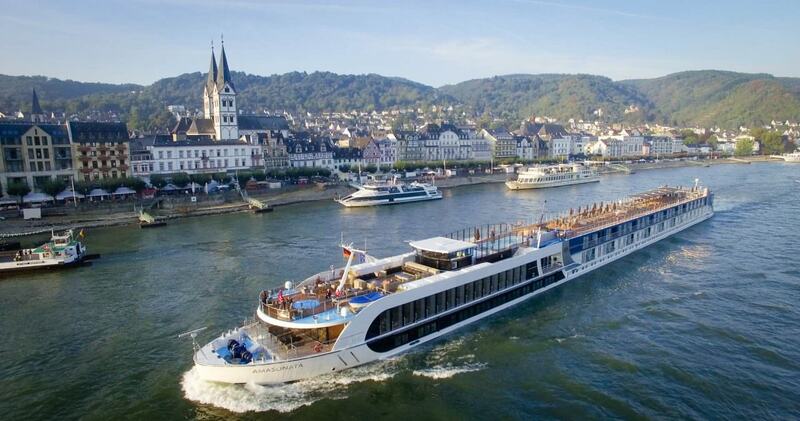 Comparative summer 2018 pricing for river cruises sailing on the Rhine, primarily between Amsterdam and Basel. I looked for staterooms of equivalent size and features, namely those with French balconies or step-out balconies. Prices were obtained from cruise company websites and may not reflect current incentives. Additional charges were estimated in some cases, such as for laundry and beverages, and obtained from the cruise company websites. * Emerald Waterways and Viking River Cruises include at least one shore excursion in each port of call, with optional excursions for a fee. ** To calculate the value of included roundtrip economy air, I used Viking's $1,595 per person published rate from select gateways in North America. *** Crystal River Cruises includes complimentary self-service laundry machines on all its river ships; pay-per-use service is can be arranged through suite butlers. ^^Riviera offers beverage packages starting at $129 per person for most weeklong voyages that adds beer, wine and soft drinks with lunch and dinner. Beverages purchased outside of mealtimes are still billed separately, so we've added $80 ($10 per day) to our valuation for beverages to bring it alongside with lines like AmaWaterways and Viking, which offer complimentary beer, wine and soft drinks with lunch and dinner. For non-drinkers, however, this total can be subtracted from the True Per Diem amount. The Rhine has many tributaries, the most important for cruisers being the Main, Moselle and Neckar. The Main is one of the Rhine’s most significant tributaries. It, along with the Main-Danube Canal, connects the North Sea with the Black Sea. The Main has 34 locks and becomes navigable at Bamberg, Germany, at the north end of the Main-Danube Canal. Some river cruise companies offer itineraries along the Main between Nürnberg, situated about midway on the Main-Danube Canal, to Trier, on the Moselle, which branches off the Rhine. The Moselle is regarded as the most beautiful — and perhaps the most romantic — of the navigable European rivers. From its headwaters in the Vogesen Mountains to where it joins the Rhine at Koblenz, the Moselle is only about 175 miles as the crow flies. But the actual length of the winding river is a little more than 335 miles, making it the Rhine’s longest tributary. The Moselle weaves its way through the vertical slopes of the Schiefergebirge mountains into Luxembourg and northeastern France. Cities and towns along the river are of fairy-tale charm: picturesque Cochem, settled by the Celts and later by Romans before being granted a town charter in 1332; Bernkastel-Kues, with its castle ruin overlooking the city center of half-timbered buildings and cobblestone streets; and the Romanesque city of Trier, Germany’s oldest city and also one that claims to be 1,300 years older than Rome itself. Trier’s Porta Nigra (Black Gate) dates from the 2nd century, when Trier was a Roman city. The Moselle is known for its (mostly) white wines, such as Riesling and Piesporter, and indeed much of the pleasure of a Moselle cruise can be found in sampling the wines along the way. This tributary of the Rhine flows 228 miles from the Black Forest through some of Germany’s most beautiful countryside. The primary attraction for many travelers is Heidelberg, Germany’s oldest university town and the cradle of the German Romantic movement.